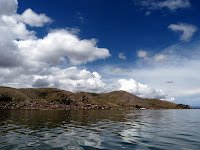 We've made our way to Lago Titicaca, the highest navigable lake in the world, and definitely the one with the best name. This is allegedly the birthplace of Manco Capac, the very first Inca, and his sister-wife Mama Huaca, and - may as well go the whole hog - where the sun itself us supposed to have came from. At 3,810 metres above sea level, it's not the incredible scenery which leaves you breathless here, although to be honest I'm having fewer problems with the altitude than before. The oul' lungs must have expanded sufficiently to be able to cope with mere scraps of oxygen. 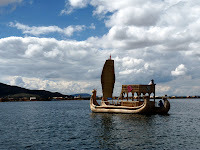 Sunday we visited las Islas Flotantes (the world-famous floating islands) where the Uros people have been floating in existence for centuries, since they first sought refuge from the warlike Incas and other pesky tribes. 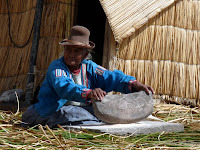 Dark-skinned, with huge-cheeks and round friendly faces, the Uros are ready to break into a wide warm smile at a moment's notice, but they also have big sad eyes. 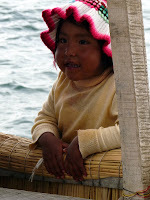 The women, like their mainland cousins, are short and frumpy, sitting on the ground as if they've no legs at all, and they also have their long black hair tied back behind their heads in long long plats. They sport wide-brimmed colourful dresses and round straw hats. Everything's made of straw; it's everywhere! 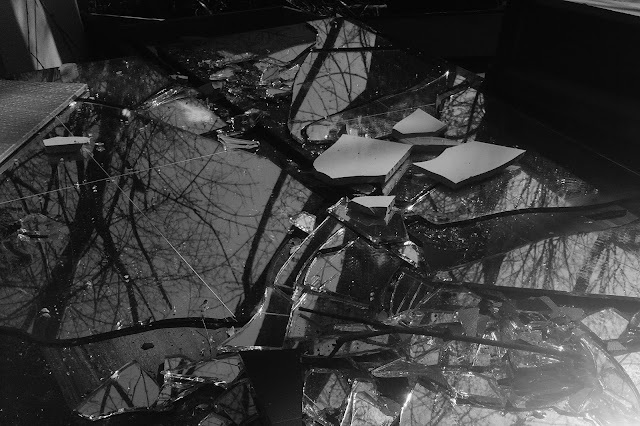 As we look around we're stepping on it, walking on it and sitting on it. Even the houses are made of straw or reeds - I was just waiting for the hay fever to kick in. The islands themselves are made of reeds cut from the lakeside and placed over the older rotting reeds below which may have been there a few months. Thus the islands are constantly replenished with material from the very lake on which they float. The ground is soft and spongy underfoot, the reeds swishing as people walk above. Of course I didn't jump up or down, wander too near the edges or light any bonfires, but the ground felt relatively secure. I'd say the islands are stable enough, as long as you don't bring any elephants or heavy machinery on board. Pigs and other smaller animals do roam around without any problems. Tourism is a big earner here. All the natives were selling trinkets and other souvenirs, ceramics and figurines, stuff that will end up on mantelpieces in lands far far away. Even the little kids, scruffy in their old worn clothing, walked around selling postcards. The island itself was tiny, not much to explore, so they really had a captive audience as we waited for our boat to leave. Boats too are made of reeds. Very impressive they are too, with straw heads like the old Viking ships, complete with little straw ears sticking up towards the heavens. We went for a spin in one made of two bound together, a "catamaran" as one of the old men called it. He was joined up front by another old man, while two of the women took the rear. It was slow progress as they all paddled at different times and angles, but we eventually got where we were going. Another island. There are about 40 altogether. "Este es la isla grande," one of the women proclaimed. It too was tiny. One minute 45 seconds was all it took to see it all. Straw everywhere again, spongy ground, more bouncing around, before it was time to go back to Puno. 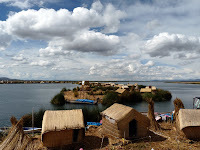 On the way through the still silvery waters, we watched lakeside fields sliding by, the old Inca terracing still there in places. Crazy-looking blue-billed ducks sat in the water beside the reeds, floating amongst them as if showing them how it's done. There were plenty of reeds. 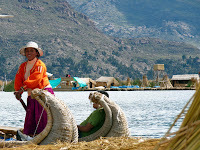 It seems the Uros will be floating plenty more years to come.